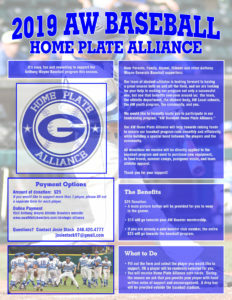 Our Strategic Alliance program will help towards raising funds to ensure our athletic programs run smoothly and efficiently, while building a special bond between the players and the community. All donations we receive will be directly applied to the AW Athletic Boosters program and will be used to purchase new equipment, to fund travel, summer camps, pregame meals, and team athletic apparel. What is the Strategic Alliance program? 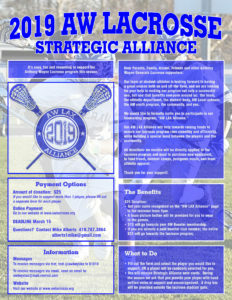 You will receive Strategic Alliance note cards at the beginning of each season. Throughout the season we ask that you simply provide your player with hand written notes, offering support and encouragement. A drop box will be provided at a location determined by the coaches. Understand that while this is a fundraiser, the true purpose of this program is to provide support and encouragement to our student-athletes as they go thru their respective seasons. The players LOVE receiving these letters of support before games. Be creative and have FUN with this.